Every day we learn new things about South Bend, Indiana mayor and presidential hopeful Pete Buttigieg. Unlike most politicians suddenly thrown into the national spotlight, most of these things are even good—like that fact that Buttigieg apparently learned Norwegian, one of the eight languages he speaks, because he once liked an author from Norway enough that he wanted to read the rest of their books that hadn’t been translated into English. Now, more from his past has surfaced, including a newspaper essay he wrote back in college about pre- and post-9/11 pop music and that time in 2015 he played piano with Ben Folds at an Indiana show. Pitchfork’s Jeremy D. Larson recently brought up another musical highlight from Buttigieg’s past: a 2003 article for The Harvard Crimson that the site describes as being about “the music [he] heard around the Harvard campus for the past four years and [reflections] on the heady political times of the Bush administration, the September 11 attacks, and the pulse of the new millennium.” This being 2003, Buttigieg centers Radiohead’s Hail To The Thief alongside Eminem and, we’re sorry to say, Dave Matthews. The Crimson piece itself is fine, but analyzing its writing style and message is probably less interesting than simply noting the fact that Pete Buttigieg now represents the only time the United States has had a chance to elect a leader whose CV includes an essay about Radiohead, Eminem, and Dave Matthews Band as well as a guest performance with Ben Folds. 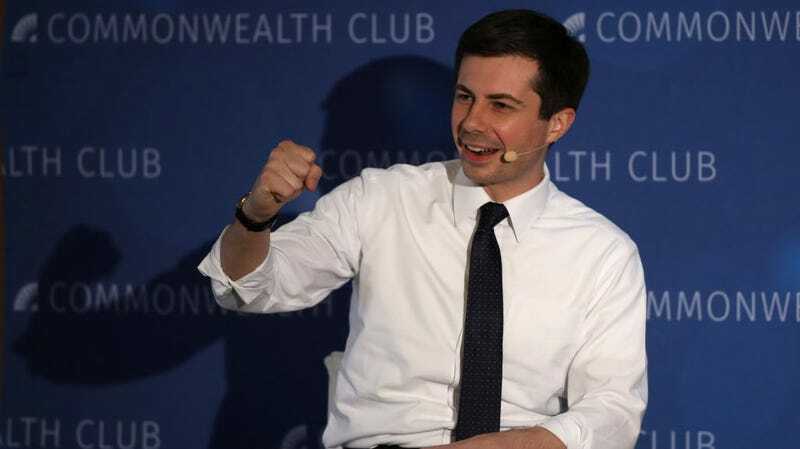 With interest in his run surging and more endearing stories surfacing seemingly every day, it doesn’t seem like there’s much holding Buttigieg back other than people figuring out how to pronounce his last name. Somehow, actually, he’s already got that covered, too.